Simon Reich is a professor in the Division of Global Affairs and Department of Political Science at Rutgers, Newark. He is author, co-author and editor of 11 books and over 50 articles or book chapters. 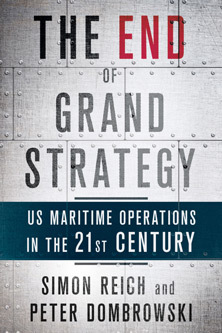 His most recent book is The End of Grand Strategy: US Maritime Operations in the Twenty-First Century (with Peter Dombrowski, Cornell University Press, 2018). Reich’s twelfth book will be a co-edited volume with the working title ‘Comparative Grand Strategy in the Modern Age’ (with Thierry Balzacq and Peter Dombrowski, Oxford University Press, 2019). His work has been translated into Chinese, Dutch, German and Japanese. Reich also previously served as Director of Research and Analysis at the Royal Institute for International Affairs (Chatham House) in London and the inaugural director of the Ford Institute for Human Security at the University of the University of Pittsburgh. He is currently a visiting fellow at IRSEM, The Institute for Strategic Studies, located in the Ecole Militaire in Paris.